DaRa Williams has practiced Vipassana Meditation for 25 years. 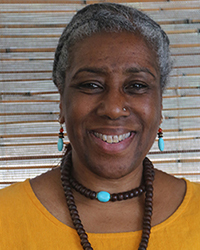 She completed the Spirit Rock/Insight Meditation Society (IMS) Teacher Training in 2016 and serves as an Associate Guiding Teacher at IMS. She is also a certified coordinating trainer for Aboriginal Focusing Oriented Complex Trauma Therapy. She is a Guiding Teacher in the Spirit Rock Compassionate Companions program. Spirit Rock: Why is the cultivation of compassion (karuna) essential to awakening? DaRa Williams: There is a non-acknowledgment around the fact that the two go hand-in-hand. Awakening is not a separate state of being that comes into existence without the cultivation of the heart and the mind. We live in a time, a place and a culture in which the cognitive functioning aspects of the brain and mind have been elevated as the pinnacle or place to operate from, at the loss and exclusion of understanding the great wisdom and contribution that the heart brings. And so we’ve been imbalanced for a very long time, going back to Descartes, and before him the Greeks. What might have been if we had been inclusive and holistically oriented? What might have gone into understanding and discovering who we are as human beings if instead of separating the heart and mind we had integrated the two? It doesn’t seem to me that awakening is something that can happen without bringing the whole to the party and cultivating and developing them both. It’s hard when there’s conditioning to lean into the non-felt sense way of knowing. It can be challenging and difficult to deconstruct that and then reconstruct ways of understanding and knowing that utilize and synthesize both the heart and mind. SR:- What does compassion bring to awakening? DaRa: Connection to self and connection to others. In our tradition, what has been cultivated in terms of the heart — and I think it’s changing a little bit — is metta (loving-kindness). We do metta, we learn metta, we teach metta, we live through metta. But the piece that elevates metta to the terrain of connection with each other, the universe, nature, so that we are not separate from any of it, is compassion. If one connects into the compassionate heart, it’s going to, at times, bring one to a place where you have to be present with personal suffering and the suffering in the world. And that can be a place that oftentimes is so difficult that we find all these ways to turn away from it. The only way we can actually meet each other and meet the world and what’s happening is by strengthening the heart. Compassion becomes an embodied way of moving towards awakening as opposed to this “above the neck” place of understanding awakening and freedom. SR: What does the quality of compassion feel like? Can you describe it? DaRa: That’s a good question. It’s an actual falling or grounding into being for me. How it feels for me is walking in life in a balanced way where I am present to this embodied self that I move around in, but not at the exclusion of everything else around me. So I am aware of each interface and experience with understanding, with seeing, with hearing. I am aware that there is a big holding of all of it as I move forward in my life. Compassion and metta, are not — some of my colleagues might not agree with this — cognitive states. They’re actually states of grace. One knows it when one feels it, compassion. It’s actually a felt sense, a knowing before the words or cognition. There’s not a formula for this, which is why I think our Vipassana practice is so good because we develop the skills to be able to discern feeling states and mind states and all of that. And so we don’t get confused or deluded about some of the other states that can feel or look like compassion, but aren’t, like pity. SR: In a dharma talk you gave at the Insight Meditation Retreat in July, you said that we have to experience self-compassion before we can truly experience compassion toward others. Can you speak a little about the importance of self-compassion? DaRa: There are many people that have a great deal of compassion. But when we don’t cultivate and develop self-compassion, we become fairly quickly under-resourced and unable to continue to move forward and be fully present with our own embodied experience as well as with other embodied beings that we move through this life with. And unfortunately it’s almost like the experience of compassion becomes rigid and inflexible in the face of not creating compassion for oneself as we sit with, engage with or meet the suffering of others. I mean, one of the ways to know suffering in someone else is to know it yourself — to be aware of what that feels like, tastes like, smells like, looks like, sounds like. And so self-compassion actually can act as a bridge between understanding compassion, having compassion, generating compassion, and offering compassion to others. In the domain of taking care of yourself, if you are opening to the experience of knowing the suffering of others and you’re not taking care of yourself, you will harm yourself. So it’s like a protective state. SR: In the same dharma talk you said compassion leads us to take appropriate action. How does it do that? DaRa: When compassion is developed and cultivated and we are present to that development, then the choices we make in terms of actions will be driven by that understanding. And one of the things that I said in my talk is that at times it could mean it’s not time to take an action. So it’s not always just about what action would result out of a place of compassion, but sometimes it’s very compassionate to know that an action is not called for and that we just need to pause and assess. Then we go through the process of seeing — even before getting to the choosing — what actions might be appropriate, what actions might be wise. The arising of that understanding is coming from the place of knowing compassion. This goes back to the question you asked earlier about awakening — awakening for what? So we can get out of here and not come back? What is driving that behavior and choices to lean into that as a goal? Why? You become enlightened, you don’t become enlightened — how are you living your life today? What are you doing today to make it better and good for you and others and us all? There’s been a particular way we’ve understood awakening over the years, is that the way Buddha meant it? I don’t know. That’s actually part of why I signed on to work with the Compassionate Companions Program because I think that there’s a strong habit, a strong conditioning towards wanting to get somewhere that has the perception that all suffering will cease when we get there. But what are we doing today? What are we doing when someone is losing a loved one? How are we being with that person? What are we bringing to them? What are we offering to the dying person or the partner of the dying person? How do we move forward as an individual with aging, when the body stops doing what it’s been able to do for the past 40 years? How do we navigate these natural places that we all have to move through? At some time — for some of us it’s when we’re younger, and for some of us it’s when we’re older — you can bet you’re going to have to navigate that. We all have to navigate that as embodied beings. So how do we assist ourselves and others to navigate these natural conditions that come about as a result of the privilege of being embodied? SR: What then does it mean to be a compassionate companion to others? DaRa: Since I’ve talked a bit about compassion already, I’ll talk about the companion part. So it’s having a journeyer, a partner in navigating these conditions of life. I think one of the biggest pieces of the partnership is the listening that you bring. So in terms of being a companion, a lot of times it’s not what you’re doing. Sometimes there are actions that need to happen, sometimes there’s movement that needs to flow. But a big piece of being a partner is providing your listening for someone, providing a holding place for someone to be able to just be with whatever the difficulties and challenges are that they may be confronted by. You know, there’s this real interdependence of care and action. So the caring piece is also a big piece. When you sit with people and help them move through having to put a funeral together for a loved one or going to the doctor and hearing for the first time that they have cancer, when we’re confronting these kinds of things, a big contribution can be bringing the emptiness, bringing the heart place to just listen before going into that action place. So for me, being a compassionate companion is to hold people, to create the spaces that allow people to just be, bringing whatever that being-ness is in the moment with whatever they’re confronting. And if you’re not tethered, if you’re rudder is not strong — which is partly what this program is about — you end up adding to the person’s suffering as opposed to really aiding them or assisting them with whatever it is that is a request to support them. So a lot of what the Compassionate Companions is about is developing and cultivating ourselves such that we can remain balanced, equanimous, loving, and aware, and bringing that listening for what’s needed at any given time with someone who’s struggling with any of these life’s difficulties.